Sunny lives in Nigeria but she was born in America to Nigerian parents. She's never sure how to describe herself, she leaves that up to everyone else. Sunny looks West Africa, but she's also albino. She's unable to play soccer in the sun because she will burn, she doesn't fit in anywhere. She discovers a new sort of family when she meets Orlu and Chichi. Orlu is one of her classmates and at school he's shy, kids even say he's stupid because he's dyslexic. Chichi lives next door to Orlu and while Orlu and Chichi are good friends, Sunny and Orlu don't get along the very first time they meet (or even the second). Then Sunny finds out that Orlu and Chichi have magical abilities and so does she. Sunny is a 'free agent' which means that she has a lot of power but it doesn't run immediately in her blood (i.e. unlike Orlu and Chichi, Sunny's parents don't have magical abilities nor do they know about the world of juju and masquerades). Sunny is soon learning magical history, juju, spells, shapechanging but there is a dark side, a serial killer is running amok, killing children for more magical power. Sunny, Chichi and Orlu are going to have to stop Black Hat Otokoto, and they may die trying. I loved 96% of this book, the only thing that really bothered me was that at times the author was obviously trying to make a point. Especially concerning the character of Sasha, it seemed like the author had an agenda. Sasha like Sunny was born in America to Nigerian parents. Unlike Sunny, Sahsa has not lived in Nigeria since he was nine and is more sensitive to how Africans treat Black Americans. Sasha moved to Nigeria without his parents as a punishment for using his magical powers irresponsibly. There were several moments where Sasha would bemoan the treatment of Black Americans not just by the police but also by Black Africans (after all the title of this novel, akata means 'bush animal' in Igbo, which is a word used to refer to American born or other foreign-born Blacks). Considering that Sasha was fourteen and a guy, I found his mini-rants random at best, annoying at worst. Continuing on with how young I found the characters to be, the love element seems forced. As if it was like 'ok two boys, two girls, obviously they will be attracted to each other'. Granted we don't know how old Chichi is, but Sasha is the oldest at fourteen. Orlu is thirteen and Sunny is twelve. I wish they could have remained friends but I do know that fourteen-year olds have little relationships so I'm going to try and be more forgiving. The thing that bothered me the most was how vague some of the magic was especially at the end. I couldn't describe to you what occurred because I'm still not sure. It's funny maybe because there's been an over saturation of Harry Potter commercials/TV specials/interviews/etc that I had HP on the brain (I'm skeptical though because I haven't read those books or seen those movies in years) but I found a lot of magic/places similar to HP. For example, Leopard Knocks reminded me of Diagon Alley (I think that's what it's called, haha. Correct me if I'm wrong). The 'using magic responsibly' rule also reminded me of the 'no magic rule during the summer' in HP. I think that's a good thing, in fact I thought it was wonderful that all the magical elements, products, etc had a certain Nigerian flavor to it (if I may call it that). And of course, props to the author for using Igbo words and not translating them. Some of them I couldn't figure out, but others were easy to discern based on context (look at that, basic elementary school skills in use ;). I was enthralled by how the author described sounds, places and people, like so "It was a haunting tune that made her want to tear off in the other direction screaming. It was the tune of nightmares. It was fast and melodious and full of warning, like the song of a sweet-throated bird happily leading the devil into the room" (pg. 325). Deliciously gritty and creepy! 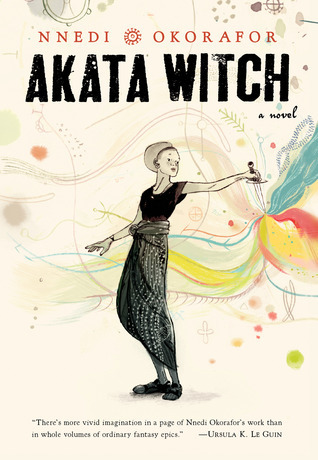 Akata Witch is the enthralling start of what will surely turn out to be a fantastic series. I want to learn more about the Oha coven (Orlu, Chichi, Sasha and Sunny), more about juju, Leopard Knocks, Ekwensu, etc. Sunny is a wonderful heroine, a bit unsure, willing to learn, able to stand up for herself worried about her parents and a great football (as in soccer!) player. I especially loved that Sunny constantly was worried about checking in with her mother, her parents weren't absent. They didn't just accept her random disappearances, she had to account for herself and work within THEIR boundaries, which I found realistic. The world of Leopard Knocks is described in ample, elaborate detail and I hung on every word. The author manages to completely describe every inflection, every little thing that distinguishes how people speak, specifically Nigerians. The subtleties of the different cultural groups are not explained in long summaries, instead through simple bursts of dialogue and observations. The only things I would want to see change is the ages of the character (why not make them teenagers? I know that can't actually be changed though) and better descriptions of the magical action. I love the celebration of differences, all the characters are unique and even though they are all Black, this novel effectively showcases how Black people/Africans really can't be put into a box (as if you need reminding). A rich tale overflowing with magic and friendship, I can't wait for more! Disclosure: From Tricia, thank you!